Welcome back to Year 4, ready to start a new and exciting term! So far the children have been excited to begin our new Topic I Am Warrior and were lucky enough to be visited by an incredible historian who specializes in Roman history. 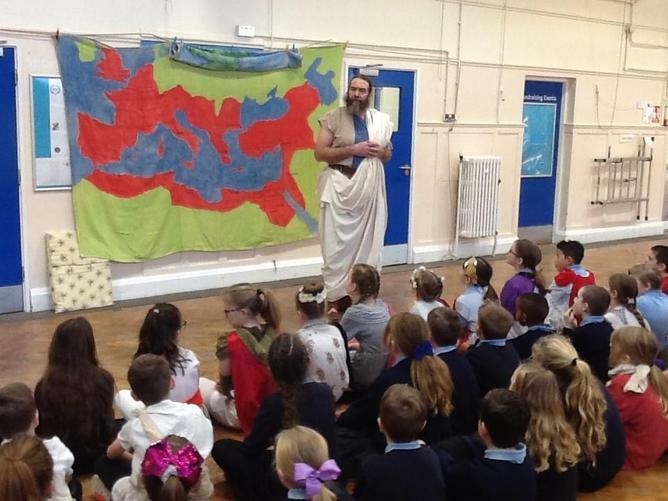 He intrigued the children by telling them about Rome's long history, how they conquered land and how they lived. The children joined in and dressed as slaves, Roman emperors, empresses and Gladiators! Merry Christmas and Happy New Year! The Children were sent home with some DT home learning for the Christmas Break. 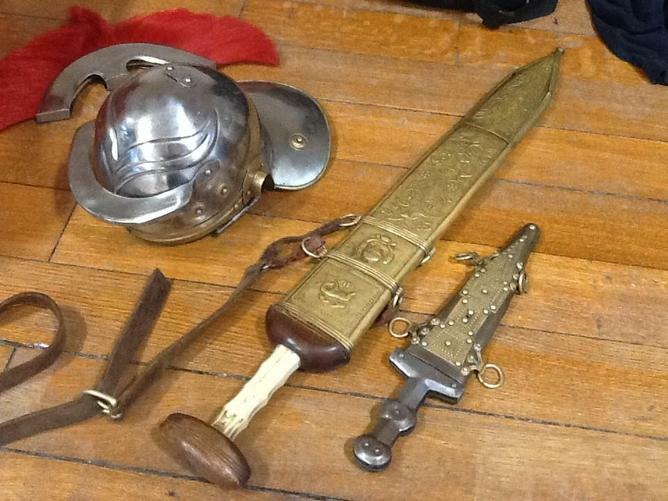 For our I Am Warrior Topic, the children will be transported through time to delve into the world of Romans and Celts. We would love if you could spend a little time getting a costume or creating some armory using your fabulous DT skills. Attached is the Home learning sheet to help you. Have fun and we cannot wait to see these costumes on Tuesday January 8th! Our learning project during the Autumn Term is 'Road Trip USA'. We are excited to become explorers of both geography and history. Year 4 are excited to travel through time and learn about the Iroquois tribe and how they have an impact today. We now have a new topic book to help us with this topic! We will also investigate human and physical features of American states in order to compare it to Lowestoft and the UK. This topic will allow us to delve deeper into British Values and SMSC as we consider democracy, rule of law, individual liberty, mutual respect and tolerance of others. We are very excited for our Sparkling Start where we have some Native Indians in school to join us! Remember your attendance matters and you need to be in to experience the Sparkling Start! PE will be on Monday alternating with Forest School. This can sometimes be changed so we suggest you keep your child's PE kit in school all week. Forest School will be on alternate Mondays. Wellies and coats are needed as we will go out in all kinds of weather. Homework activities will be sent home every week. We expect at least 1 piece of home learning each week. Feel free to do more with your child. By the end of year 4, the children are expected to know their times tables up to 12 x 12. Please support your child with learning their times tables. If you need advise on how to support your child, please arrange a chat with me. Each week the children will be focusing on a specific times table that is suitable for them to allow for them to develop their rapid recall. To start off our topic, we had a visit from American West, who shared stories, songs, and artefacts from Native America. The children were engaged from the start and were very curious throughout- they said we were the most curious children! Did you know if your hair was in 2 plaits, it meant that you were single but if you had a single bunch at the back of your head, it meant that you were married! Another fact that we learnt is that Native Americans would not kill, but in fact would just harm. In order to win a war, they would play a game of lacrosse although this isn't like the game we're use to! It could last for up to 7 days, a playing field of 2 miles by 7 miles, no referee and as long as the teams were equal it didn't matter. Again, you weren't allowed to kill, however to win, your team needed to be the last one sleeping! If the other team had all fallen asleep, or you were holding down a few people, it means you'd win! The children thoroughly enjoyed their experience, they were all engaged and excited to begin our new topic! For No Pen's Day Year 4 focused on promoting our learning value of Collaboration. The children worked together to discuss and share ideas to boost their knowledge and understanding of fronted adverbials by improving "boring" sentences and used ISPACE acronym to assist their understanding. Later, the children used their acting skills to freeze frame scenes from our Shared Reading book Twist of Gold by Michael Morpurgo. By becoming the characters, children could feel and show the emotion the characters would feel! 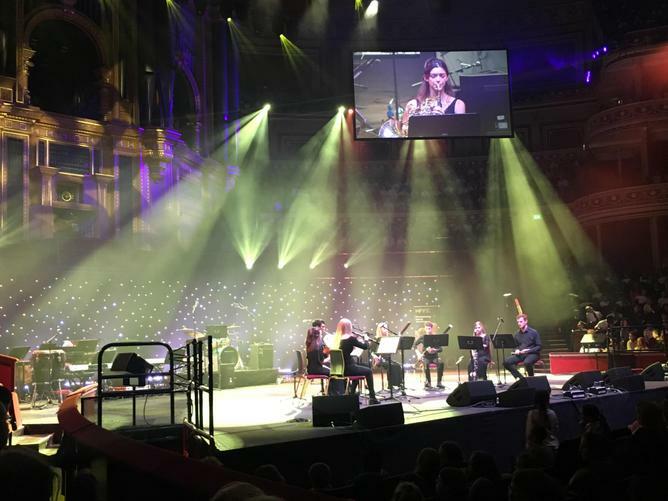 Year 4 had the exciting opportunity to visit Kensington Gardens and The Royal Albert Hall to experience a musical extravaganza. The performers were from local schools and colleges demonstrating their amazing musical talent. Despite the journey, the children thoroughly enjoyed their time and experience of beautiful, live music. Perhaps one day one of them may perform there!